Men in Black (1997) is a movie I grew up watching (it just barely missed the cut for my Childhood Favorites Week). Its story of secret agents tasked with monitoring extraterrestrial life on Earth is packed with both action and hilarity. The effects department combined practical effects with CGI to make aliens which look convincing enough without doing this. But like the black suit-clad men it features, there's more to this story than meets the eye. 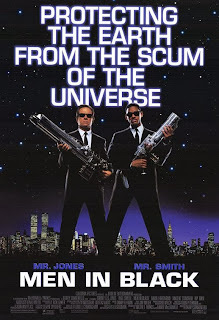 Alien invasion is an incredibly common science fiction theme, but Men in Black puts a unique spin on it which highlights the ideological underpinnings of the genre. 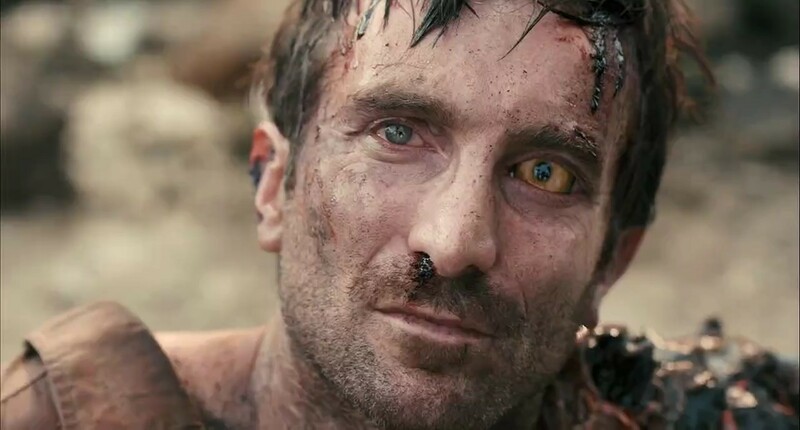 It doesn't take much imagination to understand that alien invasion movies are about aliens (from another country) and not aliens (from another planet). This reorganization explains why so many alien invasion movies trumpet nationalist pride rather than global solidarity. Men in Black turns this trend on its head. The movie opens with a scene which immediately foregrounds this symbolic association: two INS agents stop a truckload of illegal immigrants, one of which is actually an extraterrestrial disguised as a Mexican. Right away we have extraterrestrials and extra-nationals equated. Then we're quickly informed that not all aliens are bad. During Jay's examination it becomes obvious that their targets are not just any aliens, but only the dangerous ones. Afterward, Kay explains the situation: "At any given time there are approximately 1500 aliens on the planet, most of them right here in Manhattan. And most of them are decent enough, they're just trying to make a living." Aliens themselves are not the threat, merely the few aliens who are actually dangerous. He continues, "People are dumb, panicky dangerous animals and you know it." We are more of a problem than They are. We can't even be told about Their existence because We won't listen. With these two sentences, Men in Black enacts a wonderfully refreshing shift from the xenophobia that permeates your average alien movie to a critique of the self and dominant ideology. And to think that as a kid I liked Independence Day more than this. - There's this great long take when Jay first enters the MIB headquarters to take his exam which gives us a sense of the immensity of what's about to happen without being pretentious or feeling antiquated. - Speaking of old-fashioned, there's also a reference to Casablanca (which I obviously missed as a child) to explain the purpose of the MIB Headquarters. Having since seen that movie it actually is a pretty apt comparison. - This song is an instant nostalgia trip. I never really liked this movie. It feels like a 1980s movie, with some scary, disturbing imagery in the same vein as 'Ghostbusters', but I'd just seen 'ID4' and I expected more sophisticated ideas concerning aliens. Despite what you've said in your article, I found the movie had a disappointing take on aliens - they were made funny, upending the deadliness portrayal in 'ID4', 'Starship Troopers' and 'Alien: Resurrection' - 1996-1997 movies. So you could say I wasn't in the mood for 'Men in Black', a comedy that bucked the trend. Yeah I can definitely understand that. I think that's basically what happened to me with Near Dark, I expected a different tone & mood than what I was given. I like your comparison to 80s movies which makes sense to me because I love 80s movies.